Drywood Termites get their name because they require very little moisture, forming their nests and living inside their food source as opposed to nesting underground. Infestation of Drywood termites often consist of many separate colonies which originate from swarms within a structure. Shape: Elongated, abdomen is broadly attached to the thorax, as opposed to the narrow attachment in ants. Habits: Colonies are small consisting of up to 2,500 members, much smaller than subterranean termites. Drywood termite colonies do not have a worker caste, as the work is done by immature termites before they reach adulthood. Most species swarm at night, anytime in the spring through autumn and are attracted to light. 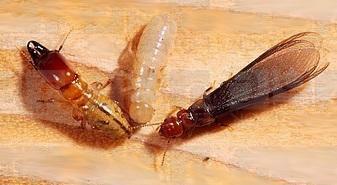 Habitat: Drywood termites are fund primarily in the southern United States. Occasionally they are found in northern states when infested wood (furniture) is moved into these areas. Colonies can be found in various location throughout structures including, attics, doors, windows, furniture, picture frames and wood carvings. The first sign of infestation is often a swarm or hard pellets being pushed out of infected wood. Threats: While colonies are small, there are often many found within and infested structure. Damage occurs slowly but is often extensive, at times requiring a fumigation to remedy the problem.